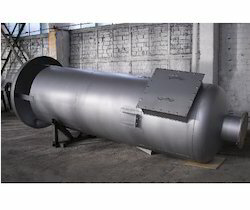 We are a leading Manufacturer of steam vent silencer, industrial exhaust silencer, turbine silencer, warm up silencers, natural gas vent silencer and blow off silencer from Coimbatore, India. 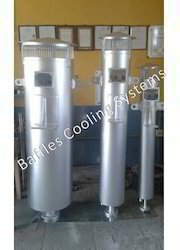 Vent Silencer is used for reduce the noise from the valve system . Generate the noise will be created in high decibel frequency.It may be occur in condition of supersonic. So in this type of unwanted noise should be arrest , for this noise arrest using the devise is Vent Silencer into atmosphere in sonic level. In this type of silencers used in oil & gas industries , Heat recovery systems , boilers ,chemical industries.,etc.,We designed the silencer based on your requirement data’s flow rate, Pressure, temperature .Our expects engineers choose for single stage diffuser or Multi stage diffuser pipe based on your data’s. From the fluid steam enters into the silencer . Fluid occurs may be in high flow passes into the silencer . Here velocity and sound attenuation is very high , so step by step should be decrease the velocity by using diffuser pipe . Diffuser pipe will be connect to the process flow pipe line. In diffuser pipe, bores or holes created on the surface area . It will be help to reduce the fluid velocity and fluid it entering into the internal chamber .In internal filled by acoustic materials .Fluid passes through the acoustic materials into the atmosphere or discharge area . 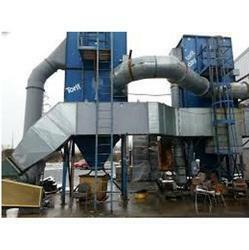 · Our Vent silencer is specially designed and manufacturing . · Frequency noise level check and using by software . · We have using the materials all are graded materials. · We designed the silencer as per the ASME code standards . · Exhaust Silencer performance as per the Noise standards and OHSAS standards . · We have the testing facility for NDE like RT ,UT, PT, MT. · Welding should be weld on the silencer used by qualified welder . · We special care is taken in internals like as absorbing materials and Acoustic packing materials like Perforated sheet , Rockwools in order to guarantee a long life. · Painting on the surface area should be check by using DFT gauge . · Good flow transmission and resulting in low pressure drop . Good flow transmission and resulting in low pressure drop. 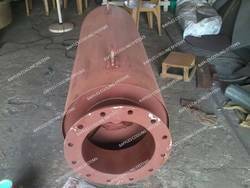 Warm up Vent Silencer is used for reduce the noise from the valve system . Generate the noise will be created in high decibel frequency.It may be occur in condition of supersonic. So in this type of unwanted noise should be arrest , for this noise arrest using the devise is Vent Silencer into atmosphere in sonic level. In this type of silencers used in oil & gas industries , Heat recovery systems , boilers ,chemical industries.,etc.,We designed the silencer based on your requirement data’s flow rate, Pressure, temperature .Our expects engineers choose for single stage diffuser or Multi stage diffuser pipe based on your data’s. 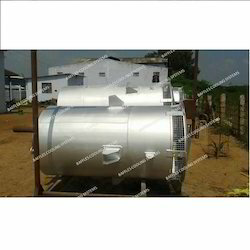 We are offering Turbine Silencer to our clients. 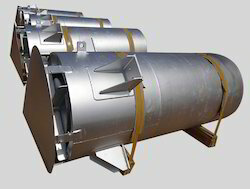 Our Vent silencer is specially designed and manufacturing . Natural gas vent silencer : Natural gas vent silencer is used for reduced the noise from the process to the atmosphere.We designed the silencer given the annular space for natural gas fluid passes through the insulations area. Hence natural gas venting is not affect and disturbed for choking. In natural gas occurring hydro carbon gas mixtures and sometime percentage occur carbon di oxide , nitrogen,helium. Blow off Silencer is used for reduce the noise from the valve system . Generate the noise will be created in high decibel frequency. It may be occur in condition of supersonic. So in this type of unwanted noise should be arrest , for this noise arrest using the devise is Vent Silencer into atmosphere in sonic level. In this type of silencers used in oil & gas industries , Heat recovery systems , boilers ,chemical industries.,etc.,We designed the silencer based on your requirement data’s flow rate, Pressure, temperature .Our expects engineers choose for single stage diffuser or Multi stage diffuser pipe based on your data’s. Noise would be generated from inlet side. It cause air entry into the chamber in high velocity from the atmosphere .Noise arrested by the insulations.Fan inlet silencer have cylinder and square shape .Cylinder shape have round type annular splitter used and in square type vertical splitter used. Here pressure drop will be calculated . Gas Vent Silencer is used for reduce the noise from the valve system . Generate the noise will be created in high decibel frequency. So it can be reduced the unwanted noise by using in this silencer. It wide used in all the gases application industrial . With the experience we have gained in this domain, we are engaged in offering a wide range of Blow Off Silencer. Discharge Silencer is used to reduce the noise from engine. Engine discharge noise will be created in high decibel frequency . Its created highly problem will be generated in atmospheric area . So in this type of unwanted noise should be arrest , for this noise arrest using the devise is Discharge silencer . From the process exhaust fluid enters into the system of discharge silencer . Fluid occurs may be in high flow passes into the pipe . Here velocity should be very high , however should be decrease the velocity by using diffuser pipe. Bores or holes created on the surface area . It will be help to reduce the fluid velocity and fluid it entering into the internal chamber .In internal filled by acoustic materials .Fluid passes through the acoustic materials into the atmosphere or discharge area . Gas Vent Silencer is used for reduce the noise from the valve system . Generate the noise will be created in high decibel frequency.It may be occur in condition of supersonic. So in this type of unwanted noise should be arrest , for this noise arrest using the devise is Vent Silencer into atmosphere in sonic level. In this type of silencers used in oil & gas industries , Heat recovery systems , boilers ,chemical industries.,etc.,We designed the silencer based on your requirement data’s flow rate, Pressure, temperature .Our expects engineers choose for single stage diffuser or Multi stage diffuser pipe based on your data’s.